I have some samples of decorator lace, and decided to use them to make some birds for my windows. I thought it would be pretty to be able to see the lace pattern against the outside foliage. After drawing a simple bird design, I used some heavy duty interfacing to provide a sturdy outline. I have a few details to work out, but I think they will be sweet for my porch windows, and for gifts. Mostly fusing, and very little sewing! 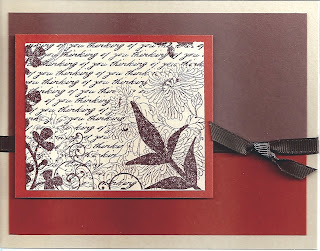 My sister-in-law, Tracy, makes beautiful stamped cards and gave a couple of them to me. I love the texture that can be achieved with different shades of the same color, and the way that cut-out shapes and embellishments add so much to the design. These cards are so pretty I have them standing up on my desk and haven't yet been able to bring myself to part with them! Here are two ATCs exchanged recently between my friend Janice and me. 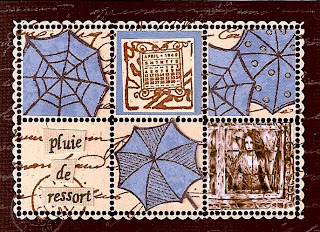 I love the beachy, vacationy feel of Janice's "stamps", and also the blue and brown color combination. 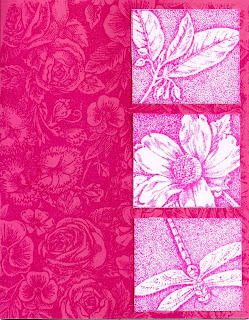 Mine is a typical "Judy" design: A crazy spray of flowers in cut paper! Fun to make! using silky fabrics from my "fancy " stash. and mounted everything on some stiffened felt. Someone has very elegant taste in bedding! 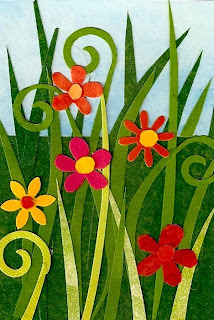 I'm just pulling some of my painted fabric flowers out to make a new picture! Creativity has been on the back burner lately but I'm getting revved up again! New finished works coming soon! I finished this piece today, an applique landscape, using all hand painted fabrics. Instead of my usual zig-zag stitch around each element, I used heavyweight brown top stitch thread in a straight stitch as an outline. There is also a bit of hand embroidery in the flowers among the rocks in the lower portion. This piece was a pleasure to make. I love trees, beautiful skies and landscapes in general, and it was fun to use fabrics I had painted myself! Here's wishing all the Moms who read this post today a happy and blessed Mothers Day! I remember today, especially, with great love, my own darling Mom, who left this world two years ago, but whose love I feel all around me each and every day. I hear the click of a shutter. It wakes me up and I get started on my bath. I look up and see that she is still there, clicking away. May I have some privacy, please?" It is so difficult, living with humans!